Depending on how much time you have: if you do Backpacking in South America the long-distance bus is the cheapest but slowest option, via plane it's much faster. 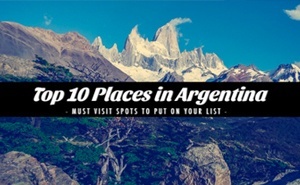 The nearest airport is located in El Calafate which offers direct flight connections to Buenos Aires regularly – Aerolíneas Argentinas has usually the best deals traveling within Argentina. From El Calafate you can go by bus to El Chalten in about 2,5h. But: use the time in Calafate to withdraw money as you'll find only 2 ATMs in El Chalten which often run out of money in peak season. The best time for trekking in El Chalten is in summer – the season starts in October and lasts until April. Before and after the season most hostels/hotels and restaurants are closed. You should definitely stay in the relaxed village of El Chaltén rather than the busy and more touristy El Calafate. Though the Internet connection is bad and most Hostels don't offer breakfast it is much more enjoyable and you're right at the starting point for all treks. I stayed at the Hostel Aylen Aike on my first visit and highly recommend it for budget travelers as the owner is awesome and loves helping you out in planning and organizing your treks or even climbs – the hostel offers small and big dorms and is nicely located. During my last visit I stayed at Lo de Guille, a family run B&B (one of the few places in El Chaltén which offers a basic breakfast). Very friendly staff & affordable prices, comes with a locked storage room (to use when you are trekking) and a kitchen for everyone to use. In case the Aylen Aike or Lo de Guille is booked out for your dates make sure to check out the other Hostels listed on Hostelworld or have a look at the El Chaltén overview page on Booking for other options such as B&B's and Hotels. I highly recommend booking in advance as spaces fill up quickly during the hiking season! This is an easy day hike where you don't have to be an experience hiker – take some sunscreen, water and food. After around 3h you'll be at the Laguna Torre. After around 1h you'll arrive at the viewpoint “Mirador Torre” form where you are able to see the towers for the first time. 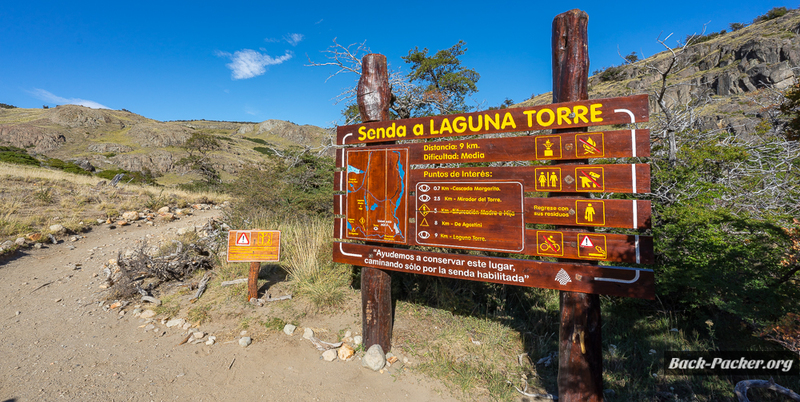 Follow the trail downhill and through flat terrain following the signs “Laguna Torre” until you arrive at the lagoon. You made it – enjoy the view! From here you have 2 possibilities to get closer to the glacier: left across the gravel or right to the viewpoint “Mirador Meastri”. The most beautiful trail gets you close to the Monte Fitz Roy, the destination is called “Laguna de los Tres”. You should start at dawn in El Chalten to avoid the day tourists from Calafate. Be prepared as the trail is pretty tough at the end! The starting point can be found in the north-west of El Chalten and is hard to miss (big signs). From there the only way is up, after 1h you reach the viewpoint “Mirador Fitz Roy” (left hand side). Continue after a little break and follow the signs to the Camp “Poincenot”. While approaching for the steepest section you get to enjoy some picturesque river crossings! After a flat section you'll arrive at the camp which you have to cross – then you cross some small rivers and get to the final and steepest part (use the chance to fill your water bottle at the river). Follow the steep trail over huge rocks up to the lagoon. Isn't it beautiful up here? Enjoy the view and use the chance to go to the small hill left hand side of the “Laguna de los Tres” to see another lagoon: the “Laguna Sucia”! Due to the well marked hiking trails you can easily connect both treks to a multi-day itinerary with camping. Day 1: Follow the instruction in 4) and leave your equipment at the Camp Poincenot before heading up to Laguna de los Tres, enjoy your day up there and spend the night at the camp. Day 2: Take it easy in the morning and head in the direction of El Chalten, shortly afterwards you'll get to a junction which you have to follow right to “Laguna Torre”. The distance to Laguna Torre is about 7km, easy doable in around 2h – the trail leads you through flat terrain passing Laguna Madre, Laguna Hija and Laguna Nieta. At the next big junction you keep right and arrive at Laguna Torre at lunch. If you want you can extend for a 3rd day by camping at the nearby Camp “De Agostini” – or you head back to El Chalten (3h). Believe it or not: Outdoor equipment is very expensive in South America – therefore I recommend buying the equipment before leaving. I also always advise on getting travel insurance as it is important to have you covered in case anything happens throughout your trip. I recommend the insurance by WorldNomads which has always been a reliable choice on my travels as it also covers many outdoor activities e.g. glacier hikes – you can use the calculator on the right-hand side to get a price for your trip! Make sure to bring the right equipment in order to enjoy your hikes! Another option is to book a complete tour – this way you can leave the organization, accommodation, transportation and navigation on the trails to local experts. 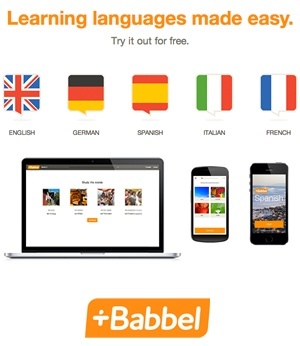 Though you pay more you'll get the full package this way including knowledgable guides. Patagonia Hiking – active 9 day tour focussing on the area around El Chaltén and El Calafate including the hikes to Fitz Roy (Laguna de los Tres, guided hike), Cerro Torre (Laguna Torre, optional), Rafting in the Glacier National Park and a visit to the impressive Perito Moreno Glacier near El Calafate. Domestic flights, Transportation, Accommodation, Rafting, Guides and Breakfast included. Argentina Multisport – the right tour if you are a true adventurer! This active 15 day tour takes you across the whole country for rafting, cycling and trekking, including the area around El Chaltén and a visit to the impressive Perito Moreno Glacier near El Calafate amongst many other destinations. All Domestic flights, Transportation, Accommodation, Rafting, Guides, Wine Tour and Breakfast included. Patagonia & Tierra del Fuego – active 14 day tour covering the highlights of Patagonia & the southern tip of the continent, including the Torres del Paine W trek, El Chaltén (Fitz Roy, Cerro Torre), El Calafate (Perito Moreno glacier) and Ushuaia. This also includes meals, guide, camps & tents, hotels, transport and porters. 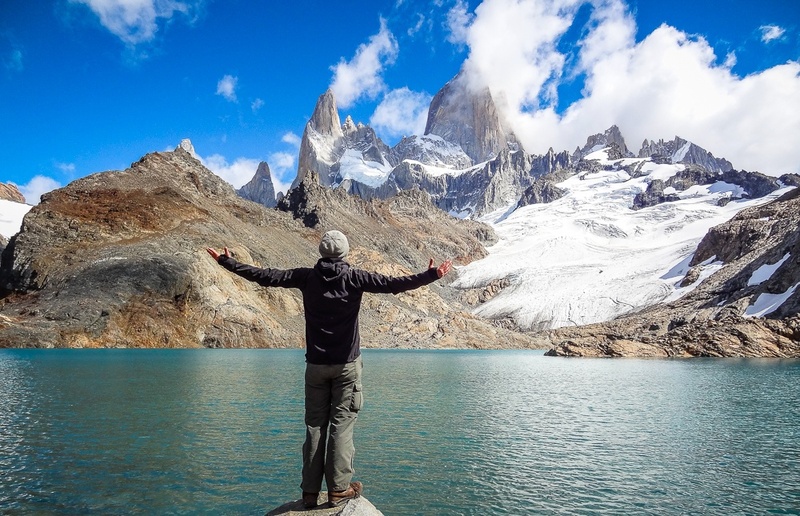 Have you done the Monte Fitz Roy Trek? 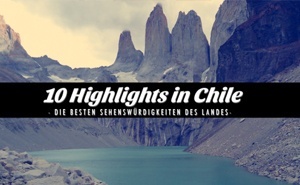 Have you been to El Chaltén yourself? Do you have any recommendations and tips regarding Trekking in El Chaltén you want to share with us? Feel free to put them into the comment section below! Disclaimer: This article contains Affiliate Links for services and products I’m using on my travels – therefore I can highly recommend using them. By using this links you won’t pay any additional fees! Thanks for the great info! Do you know how many Km from Camp Poincenot to Camp de Agostini? Thanks! Thank you so much for all the info!!! it is so good! 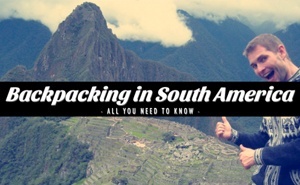 probably the best travel blog I have come across so far!!!! so useful!!!!!!!!!!!!! Thanks for all the info Steve. It’s very helpful. I’m planning on going to Patagonia for 10 days in mid-September. I realise this is a little outside the ‘Summer months’. Do you think there would be any problems doing this? Thanks for the info! Going there at the end of April/beginning of May – very exciting! One question on hikes and treks – is it ok and is it safe to do it on you own (travelling with a friend, so 2 people) or do you need to buy daily excursions every day (and if so, any recommendations on tour companies and appox prices of tours)? Hey Tatjana, it is totally fine to do the day hikes in Chaltén on your own as they are well marked. You can buy maps in town and also ask at the information center if you need any further information! Hi, I want to do a 2-day hike from June 3 – 6. Is that a good time to do fitz roy.? also, do you recommend a guided tour if I want to do something overnight? 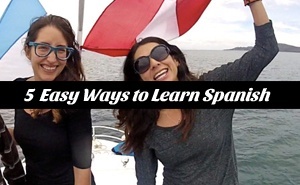 Thank you so much for all the useful info re: Chile! Any idea if Campamento Poincenot requires advance (or any at all) bookings? Hi, Steve! Just found your info and this video is great! I’m wondering how long the hike is from El Chaten to Laguna de Los Tres and Mt Fitz Roy. It doesn’t look like it took you guys 2 days. Can you break it down in hours? Thank you so much! hey – as stated in 4) it is a day hike, you should factor around 8h!